Are you an engineering apprentice, technician or graduate, who has recently started working in the engineering sector? Are you passionate about what you do, and a natural in front of the camera? Tomorrow’s Engineers are looking for a handful of career starters from a diverse range of backgrounds, to appear in a set of ‘Vox Pop’ videos aimed at inspiring other young people to consider the exciting possibilities within the engineering sector. We would like to show the different pathways and roles that are available, as well as dispelling some of the common myths associated with engineering! Please get in touch with us if you or someone you work with might like to be considered. We will be filming the Vox Pop videos in participants’ own working environments, all over the country, in the coming months. Please submit a one-page CV detailing your current and previous roles (if applicable), your route into engineering and any hobbies you might have. 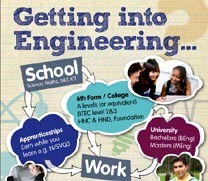 We would also be interested to hear what you enjoy most about working or training as an engineer or technician.